Breaking 300K marked a 9 percent increase over total fabrication during 2011 at 276,065 vehicles, while expansion at the plant continues unabated – as the photo at right readily demonstrates. In just the last two years the plant’s production output has been boosted by 90 percent, up from 159,284 in 2010. 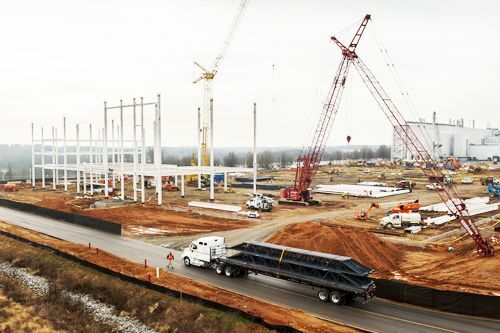 A year ago, BMW announced a $900 million expansion of the plant's manufacturing capability, adding 1.6 million square feet of production space and introducing another model, which will ultimately increase the plant's overall annual volume to 350,000 units. Construction projects can be broken down into a 170,000 square foot expansion to create a new 300,000 square foot body shop, plus a 650,000 square foot paint shop, another 400,000 square feet of new logistics and warehouse space, not to mention additional modifications to existing facilities. All these construction projects are currently underway for the facility that now produces the X3 and X5 Sports Activity Vehicle, the X6 Sports Activity Coupe, and the soon to be added BMW X4. Kicking out over 1,000 vehicles per day, 700 of each day’s output is shipped to over 130 global markets. During 2012, the brand invested nearly $5.8 Billion in the South Carolina plant. Recently, BMW of North America reported its best annual sales ever with 347,583 vehicles, combining BMW and MINI. The BMW vehicle models produced in South Carolina figure highly into the company’s US sales success, accounting for 30.7 percent of the brand's US sales of 281,460 models last year. The X5 led with 44,445 units followed by the X3 at 35,173 and the X6 moving 6,749 units. In addition to the South Carolina manufacturing facility, BMW North American subsidiaries include sales, marketing and financial services throughout the Americas, along with a design firm and technology office in California.